The last couple of weeks I've been quite productive. I guess the Konmari mission brings a good energy! 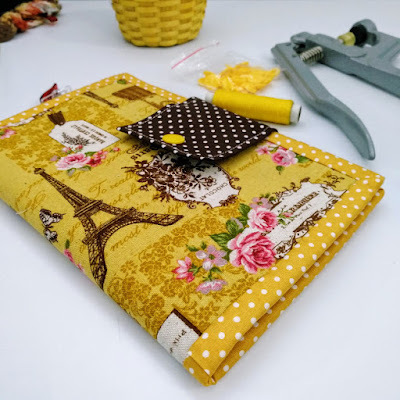 Today I finished this yellow Paris Travel Wallet which has been in my WIP bin for quite a while. Working with directional fabric is tricky sometimes. This yellow Japan linen has Eiffel Tower and bag print all over but they are not in the same direction. I didn't pay attention when I cut and turned out the Eiffel Tower was upside down. So I decided to cut another one and will think of way to use the previous one. 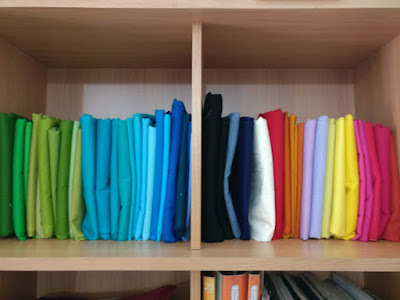 Since I finished tidying up my fabric stash, now searching for fabric combo is much easier. For this particular wallet, I decided to use this pretty small roses print in butterscotch yellow from sevenberry for the card slot. I had the fabric for quite a white and I am so glad to finally able to use it! This travel wallet is very handy since it can hold up to 6 cards, 3 passports, boarding passes, pen holder, zipper pocket for your cash and 2 slip pockets to keep your documents. It closes with snap button and the polka dots binding to make the passport holder sturdy. I am happy with the result! Sometimes, it's worth it to do that extra works to create beautiful things. It's been very hot and humid these days. I always say, the summer holiday should be extended or changed to August. But the heat didn't stop me from continuing my mission of tidying up the konmari way. Marie suggested in her book "the Life-Changing Magic of Tidying Up" to do it based on category and do it all at once for each category. This part is a little bit difficult to do, since I don't have much time. Instead, I do little by little every few days. One subcategory at a time. The past 2 weeks, I've been busy doing KM-ing for my sewing room. The first I did was the bag hardwares and sewing notions. Those were kept all over the place, so I took out everything and kept them in one rack and labelled each containers and bottles. And next to it is all the interfacing rolls. Fabric wise, I divided the category into several sub categories. 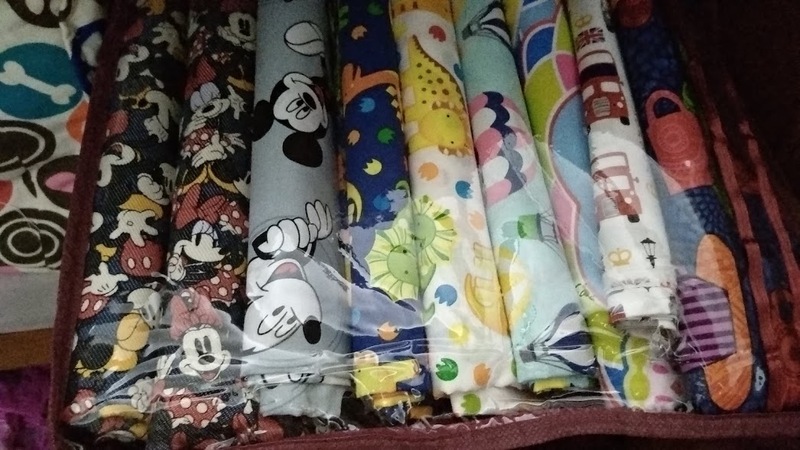 For over 2 yards of fabrics, I keep them in a saree bag with clear top which I got from Amazon. They are very handy to store fabrics. I fold them the KM way and store them in a cupboard under my sewing table. 2. Less than 2 Yards. For 1 yard fabrics, I folded the KM way around 10" wide. 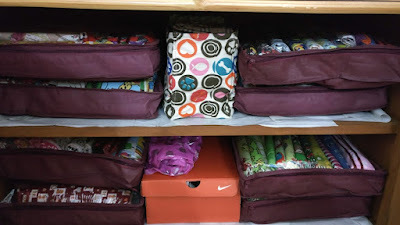 Fold and store them vertically in back row of my fabric cupboard. For Fat Quarter fabrics, I fold them smaller and place it in the front row. This way, I can still see the yard fabrics too. I don't have to sort them by colors too, since you can literally see everything there. For the Fat Eighth Fabrics, I roll and put them in a box vertically. That way, I just check them when I need just a small piece of fabrics. The idea was from Japanese fabrics I bought from my Japan trip. Once rolled, I secure it with washi tape. For Strips, I divided into 1.5" wide , 2" - 3" , 4" - 6" . I put them in separate containers and mark each of them. 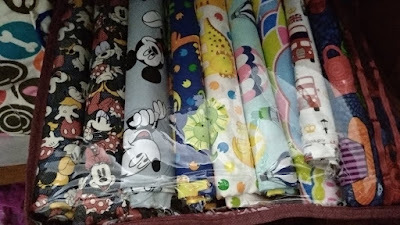 For the 4-6 inches bin, I fold each fabric and store them neatly in the bin. This way, I will know at a glance which fabrics I can use. 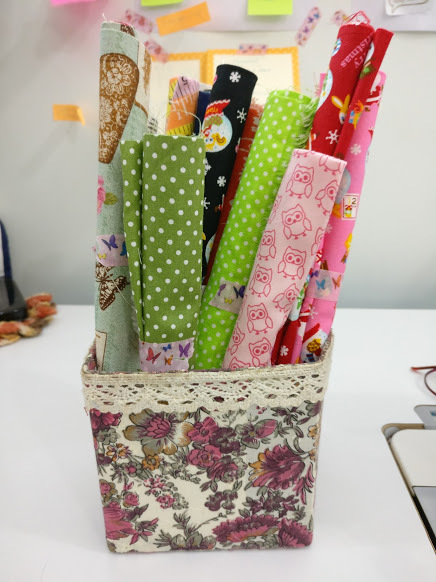 For 1.5" bin, it's always a mess, since I open it very often for binding my wallets and small quilts. I am still thinking a better way to store them. Maybe using cards. I want something that take less space. 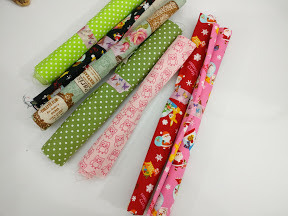 For scraps, the size can be varied as long as I know I won't be needing them for wallet and bag projects. And I already have buckets with cover and separated by colors. My biggest problem in here is the dust. That's why I want everything to be covered. I have a book case which I used to store the 2 yards fabrics. For now, I use the top row to keep the solid fabrics. I plan to make a curtain for the book case. Let's see. I'm yet to tackle the books, which I think I will do it last. But I already sorted out my paper patterns. 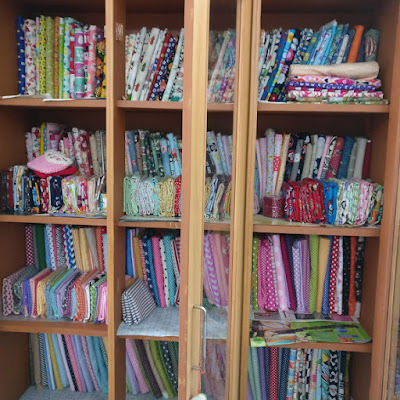 I used to have boxes filled with fabrics and most of them are all gone now. I still have more shoe boxes to sort out and then there are more scraps I kept under my computer table *sigh*. In the beginning, it was difficult to decide which stuff do not spark joy anymore. But as I keep going, it is easier for me to decide. Now I have one 28" suitcase filled with my personal fabric collection which I wish to destash. Most of them I bought from my trips. I decided I will keep less than a yard for each fabrics. - Have a clear vision of what you want to keep and how you'd like to organize your sewing room. That way you will save time organizing it. Write down your categories and subcategories. - Deal with scraps immediately. The "I will deal with it later" will ultimately never get done. - Storing vertically, give you a clear birds eye view of things that you have. 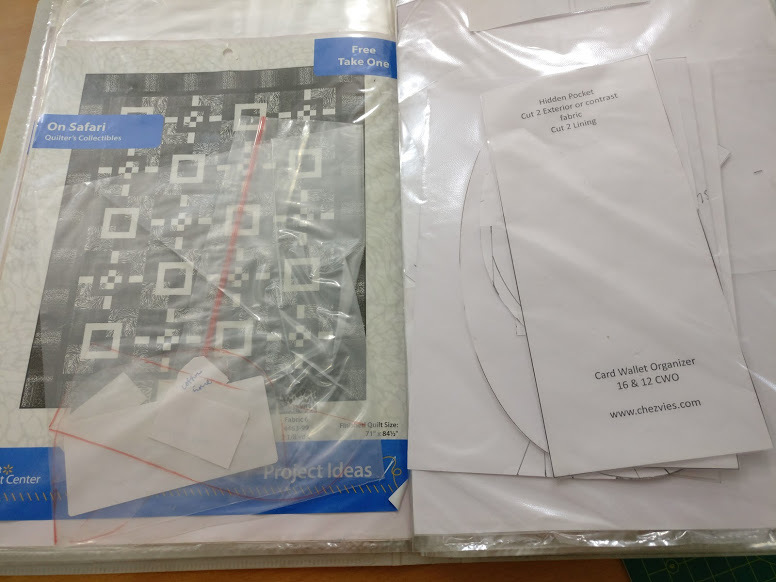 Now I can find fabrics within minutes, which normally take 2 days! - Do exercise (physical exercise) before embarking to KM journey. Believe me, sitting on the floor folding fabrics can break your back!! Plus exercise give you more energy!! - I feel more inspired after clearing up some stuff! I even managed to finish 2 orders in one evening after whole day of organizing. I still have a long way to go! So far from my sewing room alone I throw away more than 5 big bags of garbage. While from the home, we threw away 11 huge bags of useless stuff! Well, it's going to be a long journey and I am not in a hurry. That's all for the Konmari Method update. If you think you don't need to learn about tidying up, you might consider buying her book. 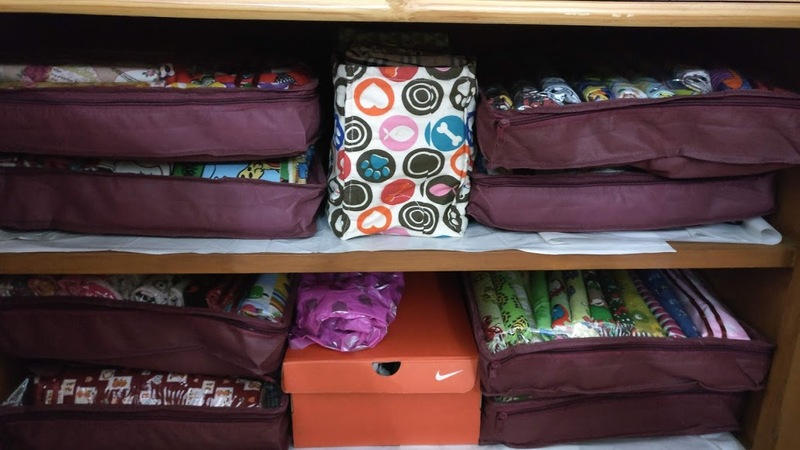 Fabric storage bin is a great way to get your home organized. There are plenty tutorials you can find in Pinterest. This week, in between finishing my wallet orders, I made these fabric bins based on Japanese book I bought last year. I always love browsing (and buying) Japanese books and magazines. They make simple things look so pretty! Nowadays, everything you can find online. And with pinterest, you can just pin stuff you love for ideas. But I find, books and magazines are still the best! In the sense, that we can easily go back to it, and read every details. Mark which project you'd love to do in the future. We can slowly enjoy the book, while sipping our mid morning tea, without being distracted by "More like this" pictures ^_^. Just like these storage bins, I was having my mid morning tea and picked up a couple of Japanese books. I needed storage boxes but the idea of buying plastic storage bins is out of the question. Because in the future when I don't need it anymore, it will be difficult to store them, right? 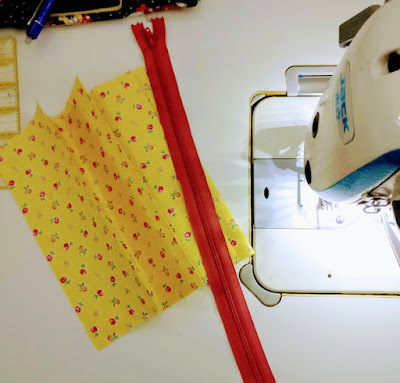 I've been looking and watching lots of tutorials on fabric bins on the net, but when I see this particular one in the book, I felt so inspired that I got down to work immediately. I decided to use denim, black and blue denim, which I had in my stash. Since denim is already thick, I put the interfacing only on the contrast fabrics. 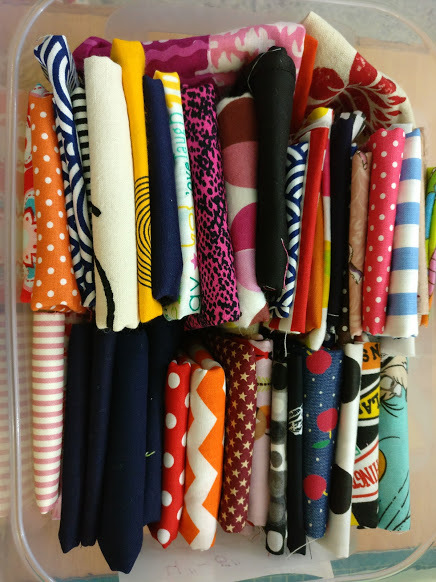 These storage bins are meant to be reversible so I chose some fun fabrics. The size is perfect to hold books, DVDs, or even craft supplies. I want to make more of these, maybe will try out a different sizes depends on my needs. I also added these storage bins for custom orders in my webshop . So, what inspired you this week? How's your week going on? My week's been pretty busy but in between I went to spa and pamper myself. The Marie Kondo book "The Life Changing Magic of Tidying Up" has arrived and I'm currently reading it. I will finish the book and will plan my "konmari" move ^_^. 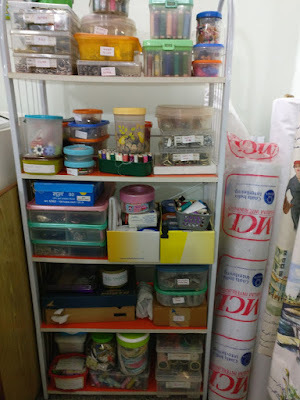 So far in my sewing room, I already put all my tools and hardwares in one corner. Arranging the fabric stash would be the tough part. I am thinking of destashing fabrics which does not spark joy anymore. So if you're in India and would love to get the first news of my fabric destash, make sure to join the group on Facebook or follow me in Instagram @chezvies_shop. In the meantime, I finished this wallet yesterday. This is another take on my Passport Wallet pattern. I had this fox fabric for a while and I thought it will be a fun travel wallet. I combined it with brown polka dots fabric. I always come up with one idea and I usually improvise as I go along. As I was cutting interfacing for the flap, I decided to make a curvy flap. It looked really good and I loved it. As for the card slot, I wrote a tutorial in this POST to get a patchwork style card slot. And then as I was going to the binding part, I was in two minds- curvy edges or straight edges. I thought making bias binding was too much of work. But I wanted curvy edges, so I stopped working and went about doing other chores. In the evening I went back to my sewing table and decided let's make the bias! And it's so worth it!! Upon reading Marie Kondo Books, I realized that, doing or keeping something that truly "spark joy" give us an immense happiness and satisfaction. With all the instant updates we always see in social media, sometimes as a handmade maker, we feel rushed. We jumped to the rat race and forget to enjoy the process. If you've been thinking for decluttering your space (and life), you might love to read the book.. Yes I know, I've been thinking along the same line too "why do I need to learn to tidy up?" but after reading the book, there are a few things I learn, like "putting things away created the illusion that the clutter problem has been solved". That definetely sound like me LOL. That's all for today. Thank you for stopping by, I hope you enjoy reading my post. Leave a comment if you'd like me to make video on bias binding.